Bowser Memory ML is a boss in Mario & Luigi: Bowser's Inside Story, encountered in the Memory Banks of Bowser's body. The boss is an embodiment of Bowser's memories of Mario and Luigi, appearing as digital, pixelated copies of the brothers, Bowser Memory M and Bowser Memory L, respectively. Their attacks and behavior reflect those of their counterparts and are references to the original Super Mario Bros. Bowser Memory M is much stronger than Bowser Memory L, but Bowser Memory L has more HP and has healing items to heal M.
Bowser Memory ML appears when Mario, Luigi, and Starlow visit the Memory Banks in order to recover the combination to the safe containing a Star Cure, after Bowser finds out he has forgotten it. The guardian of the Memory Banks scans the trio and mistakenly thought they were viruses and therefore threats to the Memory Banks, and promptly attacks the brothers. After the fight, Bowser Memory ML takes on a new form, Bowser Memory P; it says that it has switched to a temporary observation protocol, which has taken the form of Princess Peach. 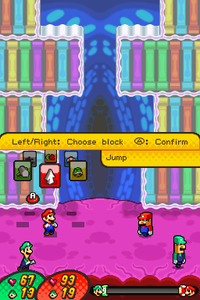 In the Challenge Node, the player can fight the stronger versions of this pair of enemies called Bowser Memory MLX. Bowser Memory M has two attacks which involve a Super Mushroom (Mega Mushroom in the remake) Memory and a Super Star Memory. When using either Mushroom, Bowser Memory M will grow and strike a series of red or green Brick Blocks above him. When the block is struck, the resulting debris will fall on the bro the color it pertains to; the type of jump also indicates the target, with regular jumps knocking debris at Mario, and spin jumps fling bricks at Luigi. The debris can be deflected using the Hammer, and may make a brother Dizzy if it hits. Bowser Memory M will then shrink back to normal (after being bitten by a Koopa Troopa Memory in the original version). When using a Super Star, Bowser Memory M will become invincible and dash straight towards one bro or other. The brothers can avoid this attack by jumping over him as he runs underneath, but if Mario or Luigi is hit, he will be knocked off the screen and re-emerge when the invincibility wears off. However, a coin may occasionally appear, and Bowser Memory M will go after it. If a coin appears above a Bro's head, Bowser Memory M will jump and grab the coin, and the Bro. should refrain from jumping (unless they jump before Bowser Memory M does and collects it, adding to the coin drop at the end of the fight). A coin may also appear in front of a Bro., usually the one not in his line of sight; in that case, Bowser Memory M will switch targets. Bowser Memory L also has two attacks: being chased by a Bowser Memory Boo or throwing a Hammer Memory. When being chased by a Bowser Memory Boo, Bowser Memory L will run and jump over a Bro; the Bro must then jump over or on the Bowser Memory Boo. Bowser Memory L will often run in circles, alternating the bro he jumps over. He stops after a few cycles pass or the Bowser Memory Boo is defeated. In his other attack, Bowser Memory L will wield a Hammer Memory and approach a bro, but will trip and toss the Hammer Memory through the air at his target. The Bros. can deflect the flying Hammer Memory with their own hammer. Additionally, Bowser Memory L will take a step backwards when he is attacked. When he's attacked for a second time, he will run off of the screen, leaving Bowser Memory M to fight alone. Bowser Memory L will return after some time, but will retreat again when he's attacked two times. However, if Bowser Memory M is knocked out when Memory L runs away, he will revive Memory M with around 60-120 HP before leaving the battle. Bowser Memory L also will sometimes throw Mushrooms to Bowser Memory M to recover 40 HP. He can also revive him via Memory 1-Up Mushrooms. Both entities have to be knocked down in order to win the battle. Spanish (NOE) Bowsermemo ML From Bowser and memoria (memory). French (NOE) Bowser_ROM/ML "ROM" refers to read-only memory. Memo-Luigi Memo is short for the English "memory"
When Bowser Memory M uses a Super Mushroom, he grows, but reverts to normal when he is hit by a Koopa Troopa. In the remake, he uses a Mega Mushroom instead, thus shrinking due to its time limit expiring. When Bowser Memory M uses a Super Star, a remix of the Super Mario Bros. invincibility theme plays while he is invincible. Also, Mario and Luigi fall off-screen if hit by this attack, just like the enemies in the 2D Super Mario games. Bowser Memory L's behavior during the battle is very similar to Luigi's personality, particularly his cowardice and fears (the retreating and the Boo Memory), as well as his clumsiness (the Hammer). These traits also reference the Luigi's Mansion games. The Bowser Memory Boo attack also partially references the Shroob Chomp attack used by the Elder Princess Shroob from the previous game. Similar to the Hammer Bro bosses from Mario & Luigi: Partners in Time, their explosion animation is the same as that of normal enemies, as opposed to bosses. The same thing happens with the Shroobs. This page was last edited on March 8, 2019, at 11:09.